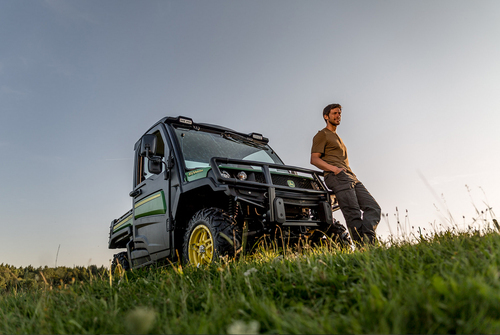 John Deere is introducing the newly styled Gator XUV 865M utility vehicle at Saltex 2017 at the NEC, Birmingham in November. Offering the company’s quietest ever cab, more room for both driver and passengers and an extremely efficient heating system, including a windscreen defrost feature, this new full-size Gator is designed to maximise year-round productivity and comfort. Featuring an 854cc, 23hp diesel engine, CVT transmission and power steering plus a top speed of 50kph, the XUV 865M offers a tight turning circle and optimal weight distribution for superior off-road performance. For extra versatility, it can be fitted with a wide range of over 90 attachments from snow blades to winches, and has a large 42-litre fuel tank to keep the vehicle running longer between fill-ups. The adjustable driver’s seat can accommodate three people, for off-road use only. This latest model also features ample legroom and a tiltable steering wheel to help reduce driver fatigue during long working days. The versatile and durable cargo box has a load capacity of 454kg, while towing capacity has been increased by a third to 907kg and total payload capacity is 680kg.